NASHVILLE, TN--(Marketwired - April 06, 2016) - Red Kap, the world's leading automotive apparel manufacturer, continues to raise the bar for automotive uniforms. 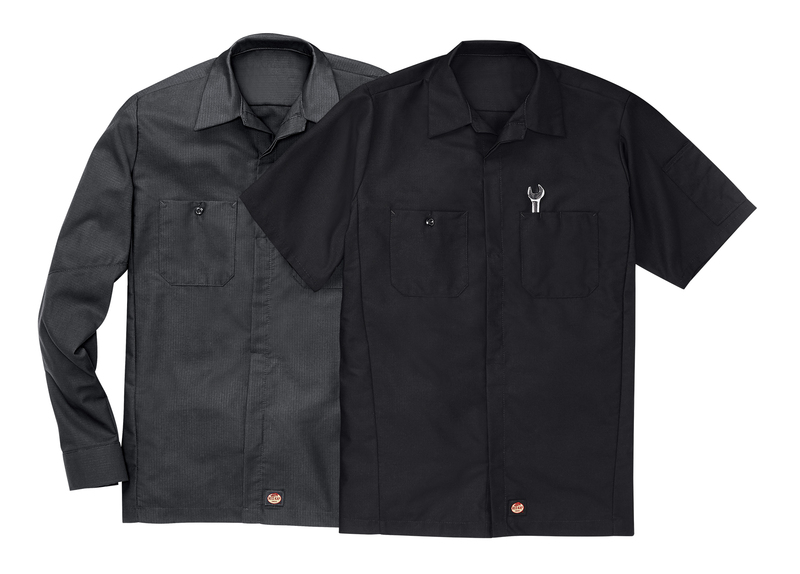 The workwear giant is now offering its best-selling product, the Crew Shirt, in two solid colors -- black and charcoal. Since its launch in 2010, The Crew Shirt has been the brand's fastest-growing new product, with no signs of slowing down. The iconic Crew Shirt was previously available in seven racing-inspired color-block patterns, including the newly launched charcoal/orange and black/lime styles. The new black and charcoal versions offer a more traditional alternative to the modern color-block options. The Crew Shirt is packed with premium features meant to enhance daily performance while maintaining all-day comfort. For example, Red Kap's exclusive ripstop fabric is lightweight yet breathable and 75% stronger than other poplin workwear fabrics on the market. Plus, Touchtex™ fabric technology resists stains, improves moisture wicking to keep the wearer cool and dry and retains color for a vibrant, clean appearance wash after wash. Spending time in garages with mechanics helped the Red Kap design team develop innovative features like a sleeve pocket that keeps small tools and pens within reach and covered buttons to keep paint jobs protected. The color block design strategically places darker colors in areas that most frequently come into contact with grease, oil and grime, helping mask stains until the next wash. Plus, it is engineered to maintain its integrity after multiple washings in industrial-grade laundry facilities, helping extend the life of the garment even in the most rigorous working conditions. Testing with real-world mechanics produced positive results. More than 85% of those surveyed preferred the Crew Shirt over their existing work shirt, which explains the shirt's undeniable success with auto pros. Red Kap remains dedicated to bringing fresh, innovative workwear to the auto industry, further cementing its standing as the automotive image expert. Find a complete listing of Red Kap Distributors at www.redkapautomotive.com/Distributors. For more details about Red Kap products, visit our website and social media outlets. Red Kap manufactures comfortable, durable apparel for more than 16 million hardworking professionals and offers unmatched service to approximately 8,000 distributors. For over 90 years, the company has provided everything from work shirts and pants to jackets and coveralls for a variety of industries, like manufacturing, transportation and construction, while specializing in performance workwear for the automotive industry. Red Kap is a division of VF Imagewear, Inc., which is part of VF Corporation, the world's largest apparel manufacturer. Visit redkapauto.com for more information. Red Kap manufactures comfortable, durable apparel for more than 16 million hardworking professionals and offers unmatched service to approximately 8,000 distributors. For over 90 years, the company has provided everything from work shirts and pants to jackets and coveralls for a variety of industries like manufacturing, transportation and construction while specializing in performance workwear for the automotive industry. Red Kap is a division of VF Imagewear, Inc., which is part of VF Corporation, the world's largest apparel manufacturer. Visit http://www.redkapauto.com for more information.